The State Department is warning Americans abroad to be cautious of violent anti-American demonstrations following controversial plans by a Florida church to burn copies of the Koran. The Department of State is issuing this Travel Alert to caution U.S. citizens of the potential for anti-U.S. demonstrations in many countries in response to stated plans by a church in Florida to burn Qur’ans on the anniversary of the September 11, 2001 terrorist attacks. Demonstrations, some violent, have already taken place in several countries, including Afghanistan and Indonesia, in response to media reports of the church’s plans. The potential for further protests and demonstrations, some of which may turn violent, remains high. We urge you to pay attention to local reaction to the situation, and to avoid areas where demonstrations may take place. 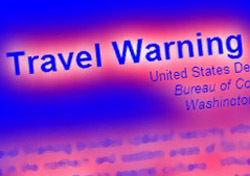 This Travel Alert expires on September 30, 2010. The State Dept. also reiterated its standing recommendation that all Americans living or traveling abroad register with the nearest American Embassy or Consulate. Indeed, the New York Times reports that demonstrations in Afghanistan have turned violent, with multiple injuries and one death so far. Reactionary demonstrations are expected to continue through the weekend, and will almost certainly escalate in size and violence if the Florida church goes through with its planned Koran burning.